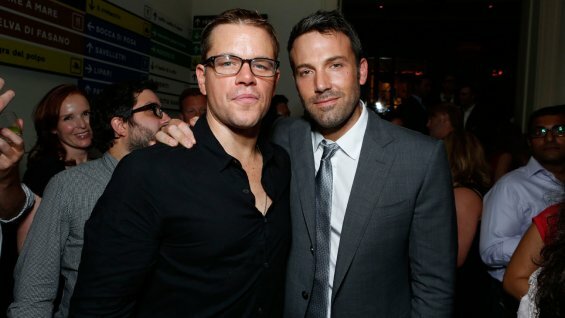 Matt Damon and Ben Affleck Incorporated Into Syfy Family! Matt Damon and Ben Affleck are doing sci-fi with Syfy – their Pearl Street Films is developing Incorporated, a futuristic espionage thriller for the cable network. In the future, corporations have all the power and Incorporated will be the story of one man’s efforts to beat the system. Check out the press release following the jump. NEW YORK— October 13, 2014. Syfy announced today it is partnering with Matt Damon and Ben Affleck’s Pearl Street Films and CBS Television Studios to develop Incorporated, a futuristic espionage thriller set in a world where corporations have seemingly unlimited power. This will be the story of one man’s efforts to beat the system. CBS Television Studios is one of the industry’s leading suppliers of primetime network programming, with top scripted series dramas “NCIS,” “NCIS: Los Angeles” and comedy series “The Millers.” The studio’s roster of popular and critically-acclaimed programs also include the phenomenally successful CSI franchise, “Elementary,” starring Jonny Lee Miller and Lucy Liu, the Peabody Award winning series “The Good Wife,” starring multiple award winner Julianna Margulies, summer event series “Under the Dome” and “Extant” starring Academy Award winner Halle Berry; The CW’s “Reign,” the daytime talk show “The Talk,” and BET’s top-rated sitcom “The Game.” New series include “NCIS: New Orleans,” “CSI: Cyber,” “The Odd Couple,” “Madam Secretary” “Scorpion” and “Zoo” for CBS and “Jane the Virgin” and “The Messengers” for The CW. Previous PostDirector Michael Cuesta chats about Kill The MessengerNext PostFOX Orders Six More For Gotham!